While many visitors here choose luxury resort and boutique hotel accommodations, camping is a great and inexpensive way in which to enjoy all that Banff National Park and Canadian Rockies have to offer. There are 13 campgrounds with a total of 2,468 sites in Banff National Park that cater to everyone, whether they prefer tents, trailers or RVs. Most campgrounds in Banff National Park are booked on a first come, first served basis, though reservations can be made for Tunnel Mountain and Lake Louise campgrounds starting in the spring. These campgrounds are close to Banff, located on – you guessed it — Tunnel Mountain. From here you can walk or take the bus to downtown Banff. Many campsites here feature a wide-angle view of the valley, hoodoos, and the Banff Springs Golf course. Services such as food, laundry and a water slide are close by. 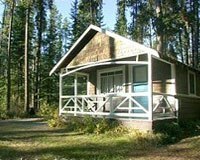 Interpretive programs are offered at the campground theater throughout the summer. 321 full service sites are available in the Trailer Court, open from May – October. 188 power-only sites are available in Village II, open year-round. 618 non-serviced sites are available in Village I, open from May – October. Two Jack Lake campgrounds are located 12 kilometers from Banff, along the Minnewanka loop. Both are wooded, offering picturesque and secluded sites as well as ample opportunities for wildlife viewing. These sites are available on a first come, first served basis, so arriving early is recommended. Check-out time is 11 a.m. This is the larger of the two campgrounds; it is open from mid-May through mid-September. Directly across the road from the main campground, the lakeside campground is smaller, with several sites backing right onto Two Jack Lake. 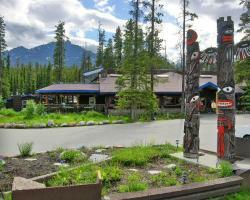 This mid-sized campground is located 25 kilometers from Banff if you’re traveling west along the Bow Valley Parkway. 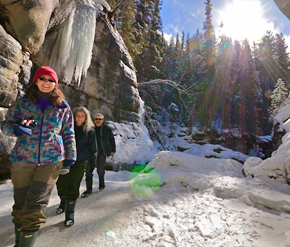 The best part about this campground is that it is close to Johnston Canyon Trail, one of the loveliest – and consequently most popular – hiking trails in all of Banff National Park and perhaps all of the Canadian Rockies. The campground is open from early June through mid-September; all sites are available first come, first served. Located halfway between Banff and Lake Louise along the Bow Valley Parkway, the Castle Mountain Campground is beautifully wooded and secluded. Even so, it is located close to a small store, gas station, bar and restaurant, for those that like to rough it without getting too rough. Castle Mountain Campground is open mid-May through early September, sites are available first come, first served. Protection Mountain Campground, which operates under the Campground Host volunteer program, is located in an area sprinkled with wildlife and hiking trails, 48 kilometers from Banff or 17 kilometers from Lake Louise along the Bow Valley Parkway. This small campground may be remote, but is nevertheless a bit genteel, as rustic camping goes. The Protection Mountain Campground operates from late June through early September, with sites available on a first come, first served basis. Lake Louise lies about an hour’s drive north of Banff town, and is one of the most beautiful places in the province of Alberta – a province full of beautiful places in the heart of the Canadian Rockies. 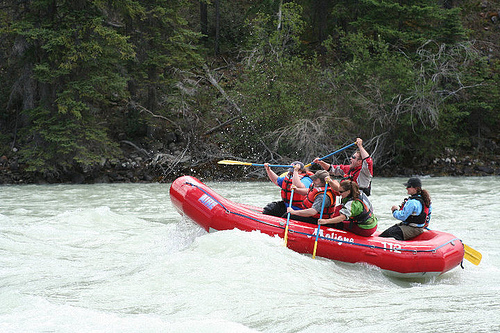 The Lake Louise campgrounds lie in a wooded site along the Bow River, 1 kilometer from the Village of Lake Louise and 4 kilometers from the lake itself. Several hiking and biking trails are accessible from these campgrounds. Because the Lake Louise campgrounds are located within sensitive wildlife habitat, there are several initiatives in place to protect both people and animals. To educate campers, Parks Canada presents interpretive programs at campground theaters throughout the summer. These sites can be reserved beginning April 2; to make a reservation, please visit Parks Canada or dial toll free 1-877-737-3783 (1-877-RESERVE) (7:00 AM to 7:00 PM), TTY: 1-866-787-6221. This campground is open from May to October, however in early spring (April/May) and late fall (October/November), tents and soft-sided trailers are not permitted in the Lake Louise Campground to help protect both people and bears. During these shoulder seasons, tent camping is available at Mosquito Creek, Tunnel Mountain Campground, and Kicking Horse (closes October 6; 23 kilometers west on the Trans-Canada Highway). 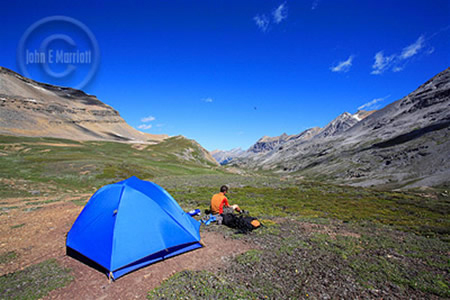 Named after the not-so-subtly named Mosquito Creek, this campground sits underneath the majestic cliffs of Mount Hector, 24 kilometers north of Lake Louise along the Icefields Parkway (. Open year round, this campground offers just the very basic of amenities. Waterfowl Lakes Campground is located 57 kilometers north of Lake Louise on the Icefields Parkway, at the spot where the Mistaya River flows into Waterfowl Lake. Open from late June through early September, this campground offers easy access to Cirque and Chephren Lakes via a hiking trail. It also is administered as part of the Campground Host volunteer program. Rampart Creek Campground, located near the Columbia Icefield, is set in a location ideal for wildlife viewing and taking in awe-inspiring views of the mountains. This small campground is open late June through early September.